Always having trouble maintaining the grass surface around your outdoor swimming pool? Why not call Artificial Style and switch to artificial grass? At Artificial Style, we make sure that our clients from Dorset, Hampshire, Poole, Bournemouth, and surrounding areas get the service they need. Whether you need artificial turf for your home swimming pool surrounds, or you want to add a summer feel to your indoor swimming pool, Artificial Style is the name you should remember. Imagine having a pool with luscious artificial grass pool surrounds. This means there’s no mowing required, and you don’t have to scoop grass chippings out of the swimming pool ever again. During summers, kids usually spend time around the home swimming pool. Especially when you have an above-the-ground swimming pool, you always worry about cleaning muddy foot prints inside your home. Having artificial grass pool surrounds alleviates common grass issues like these. Artificial Style is the number 1 artificial grass provider in Dorset. At Artificial Style, we only give high quality service and install Astro Turf-like synthetic grass around swimming pools, and more.Our artificial turf is what you need for your swimming pool landscaping as it is durable and reliable. Heavy use, harsh weather, and water splashes with chlorine content cannot easily damage it. No matter how much it snows, rains, or even hails in your area, you’ll still have luscious and freshly cut looking artificial grass pool surrounds.We are proud that our artificial grass will look and feel realistic for your swimming pool landscaping. Our artificial turf feels as soft and as cushioning to the feet as healthy, natural grass does. So if you’re thinking of what to use as surface for the area around your swimming pool, contact Artificial Style now. We provide a wide selection of artificial grass perfect for all swimming pool designs. 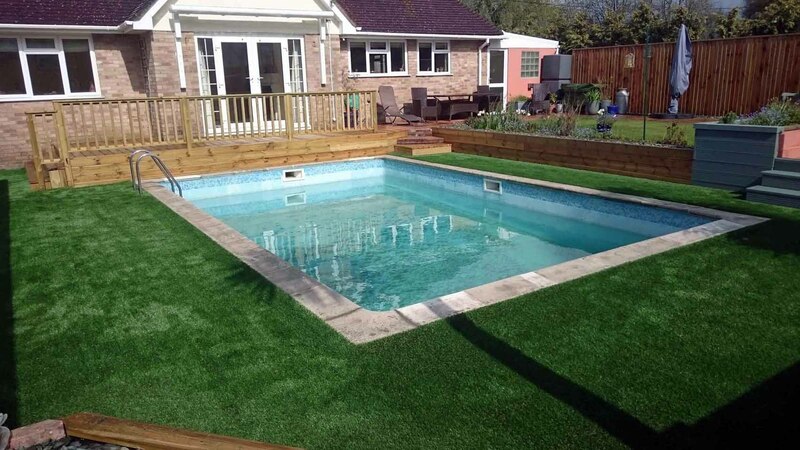 Whether you need artificial grass surface for indoor, outdoor, home, or above-the-ground swimming pool surrounds, Artificial Style can provide the right cut, design, and specifications for your swimming pool landscaping and for installation of artificial grass in Dorset. We offer Services including Artificial grass and fake plants supply, installation, garden landscaping, paving and high quality composite decking in all areas of Dorset and Hampshire including Poole, Bournemouth, Ferndown, Christchurch, Salisbury, Ringwood, Blandford and etc.